Join us for “A Night in Paris” at Positive Images’ 2013 QueerComing LGBTQQI dance! 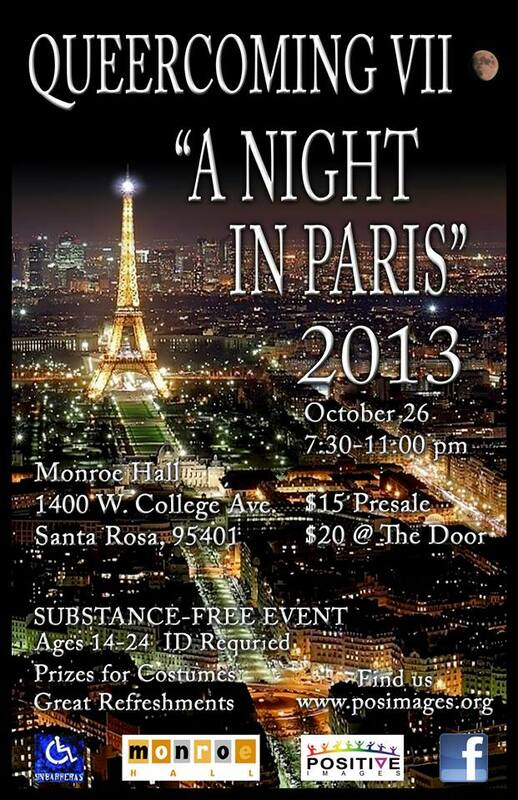 It will be held Saturday, October 26, 2013 at Monroe Hall (1400 W. College Ave. Santa Rosa, CA 95401). Snacks, refreshments, and prizes for costumes will be provided. This is a substance-free event for youth aged 14-24 (ID Required), and 100% LGBTQQI safe. Tickets are $15 pre-sale and $20 at the door, and are available Mon-Fri 1-5 PM at Positive Images’ Center (312 Chinn St. Santa Rosa, CA 95404). Please call the Center at (707) 568-5830 to reserve your ticket or to obtain more information! Hella Gay Prom VII! Arabian Nights!